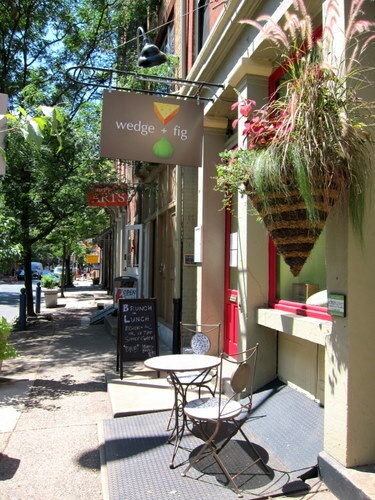 Wedge + Fig is an adorable cheese shop and casual cafe in old city. I stopped by recently for brunch in their courtyard, truly an oasis. You would think it would be hot out there, but it’s fairly shady and covered, so it was quite lovely. You also get to look into the kitchen to see what everyone’s up to. 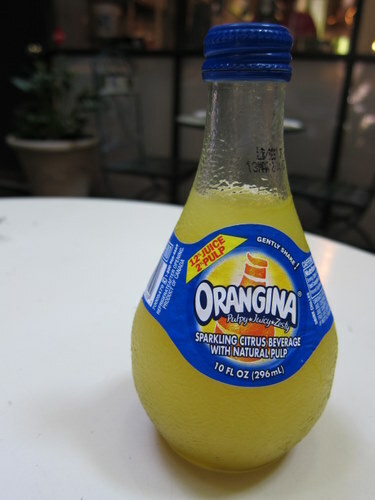 I decided to get an orangina just for kicks. I’d forgotten how refreshing this little funny bottle can be. 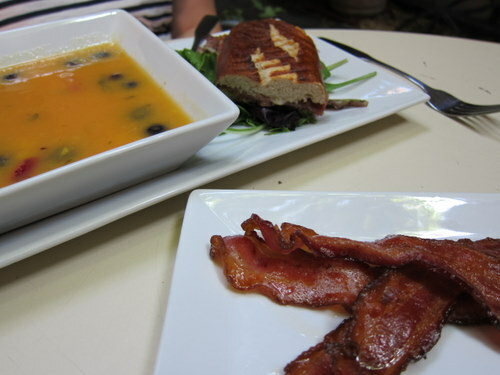 We both ended up getting a 1/2 sandwich and soup combo. 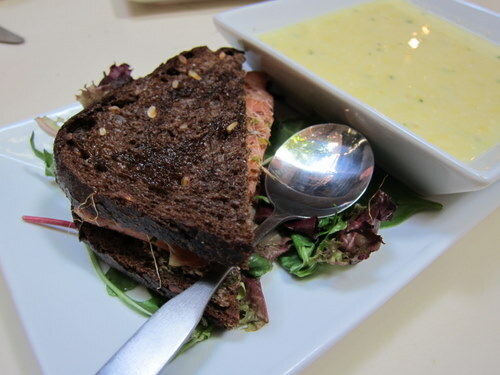 They ended up putting the switching the sandwiches, so this was not my sandwich, but it was my soup. This sandwich is the Svenson, with lemon-dill creme fraiche, nova lox, and sprouts on pumpernickle bread. My soup was one of the specials of the day, which was a creamy lemon and corn soup. It was lemony, it was corny, it was cool and refreshing. This is my sandwich, the Blue Figs, with fourme d’ambert cheese, fig preserves, and prosciutto on pretzel bread. Ooh, this thing was good, especially the pretzel bread! It’s pressed too, so really easy to eat. i wish I’d had a whole sandwich. The soup that E got was another special of the day, and it was a summer fruit gazpacho, with mango, berries, and other delicious fruits. It tasted like a smoothie! But in a bowl! E also got a side of bacon. Look how lovely and thick that bacon is. Yum. 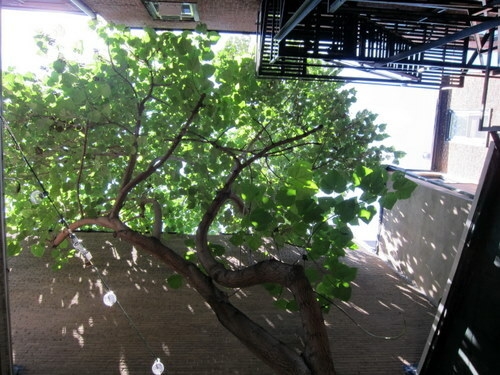 Here’s what you see when you look up from the adorable courtyard. We both really loved this place, and plan on going back again and again. The inside is adorable too, with some small tables for dining and random food items, along with of course, cheese! There weren’t too many people here, which made us worry, because we don’t want this place to ever go away! Service was friendly, food was great, the courtyard is cool and inviting. I want to try everything on their menu!